I haven't sewed a stitch on a machine in about 15 years. The random loose hem or lost button was the only thing that brought needle to thread in my house for many years, though I learned how to machine sew in high school. Wait, I learned before that because my Momma sewed like crazy and taught me a bit before that Home Economics class in school. But I digress . . . Although I never was one to sew my own clothes, I did know the basics, and when a project struck me, I would give it a go. I have a few random pillows in my past along with a rather involved historic military great coat I once made for my husband when he was a Civil War reenactor. The last 15 years, though, nothing really moved me to want to load a bobbin and press that pedal to drive the machine to stitch-stitch-stitch. 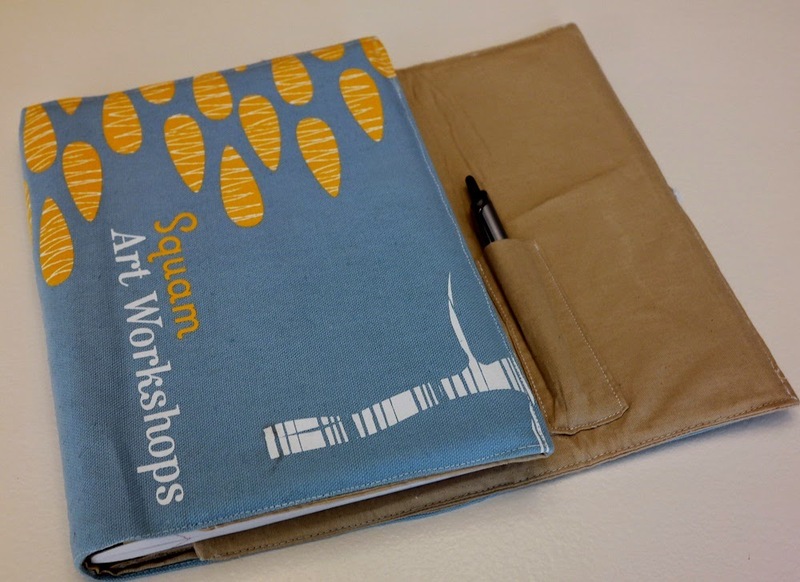 When registration opened for Squam Art Retreats at the beginning of December, a contest was announced as well. The prize is a full-ride scholarship to the retreat. 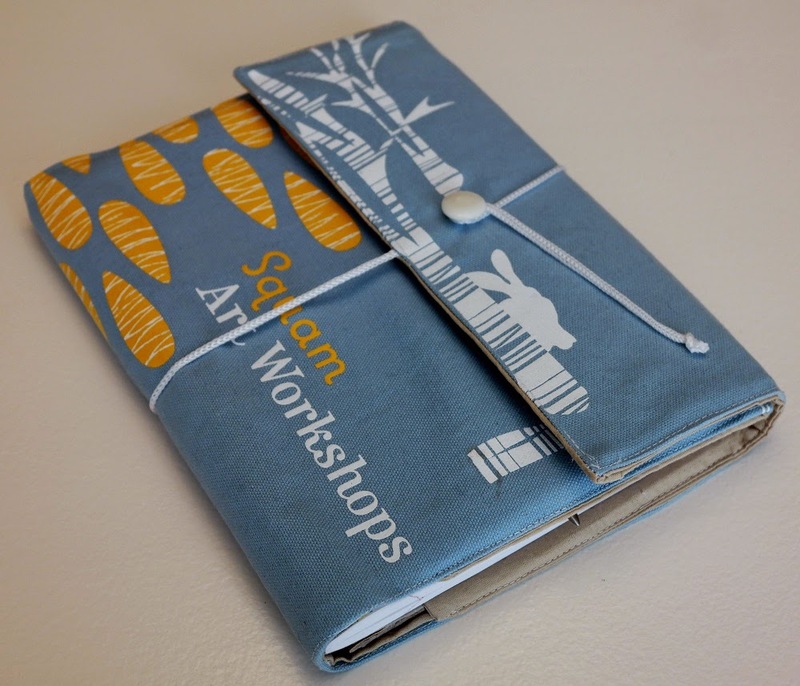 The rules required the purchase of one of the old Squam retreat tote bags to serve as the entry fee, and the goal was to make something out of the tote bag - repurpose it, get creative, go wild, or be practical. The only requirement was that the logo from the tote bag appear somewhere in the finished product. There was no hesitation from me. Click, pay, I'm in! 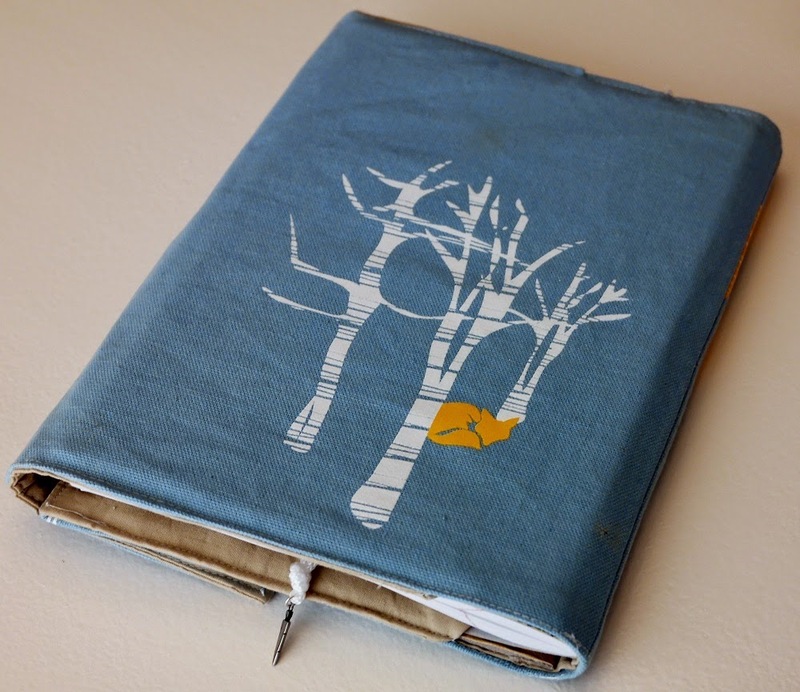 The first idea I had was a notebook cover of some sort. 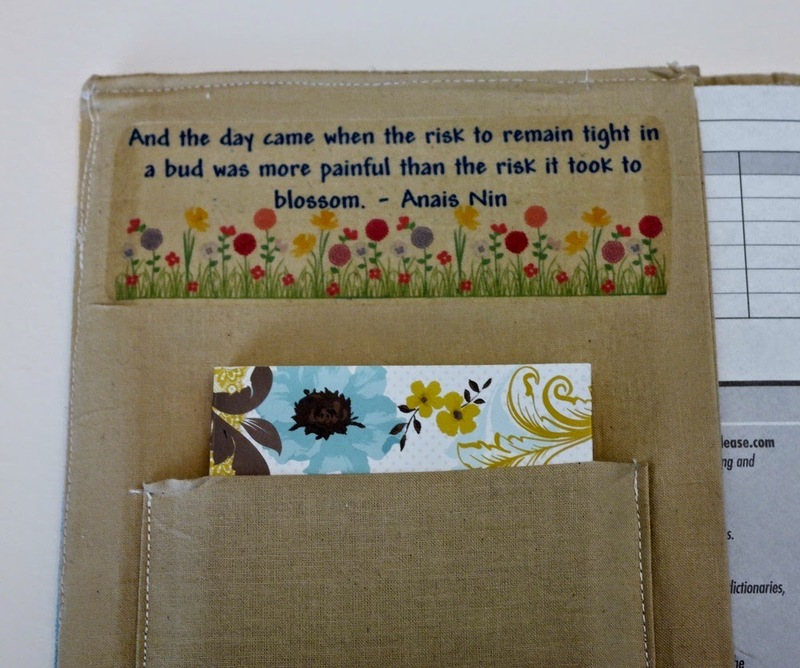 Then I thought I should try something more daring and listed other things to make. A hat. Shorts. A pillow. A refashioned bag. A wallet. These ideas rattled around my head for a few weeks before I felt I had to make a decision. Go with what you know, Rita. Go with what calls you. multiply in my study as I scribble my random thoughts onto the page. 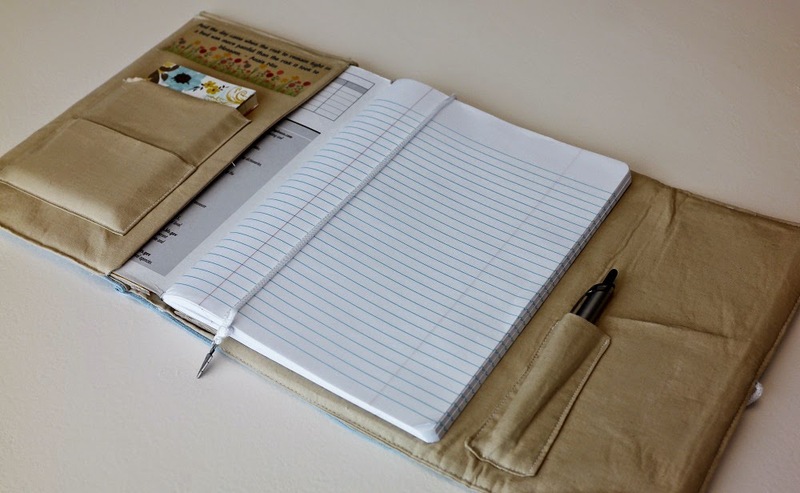 A few pockets on the inside are perfect for holding a favorite pen, a small address book, a few postcards, and stamps (because I always have to jot cards to folks when I'm traveling). 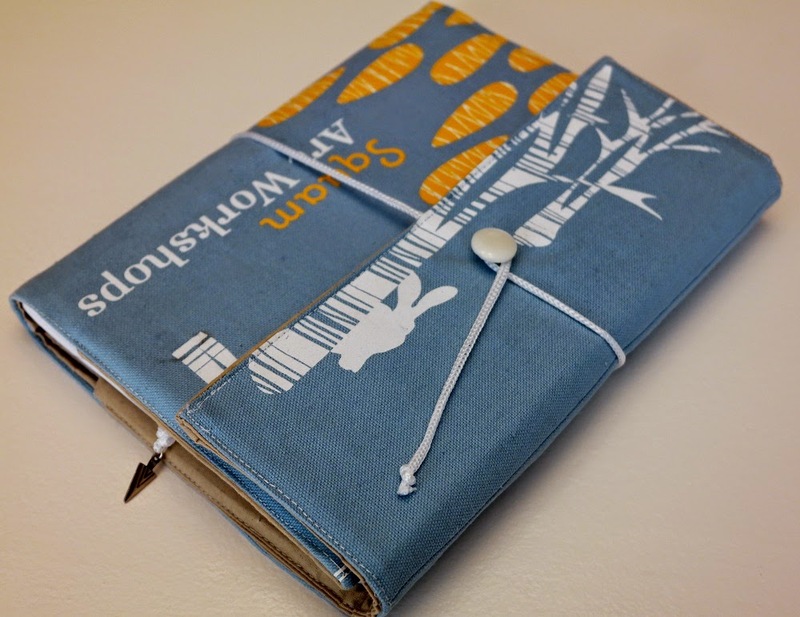 I decided to make an all-encompassing travel journal ensemble which would hold everything I needed for writing on the go. Here is the journey from tote bag to finished contest entry. The tote arrived in the mail with good wishes for the contest. It took a lot of courage to rip the first seams during deconstruction. After a week of drawing ideas and calculating placement, I finally cut a pattern and laid it out. Moments before the first cut. I hesitated a few times before actually doing it. I only had one tote so there was no room for mistakes. After all the cutting, this is all that remained. In about an hour of machine work, it came together into what I imagined. I stayed up much too late because I wanted to see it complete. I went to bed when it was mostly complete, leaving only a button and a quote detail on the inside to finish. 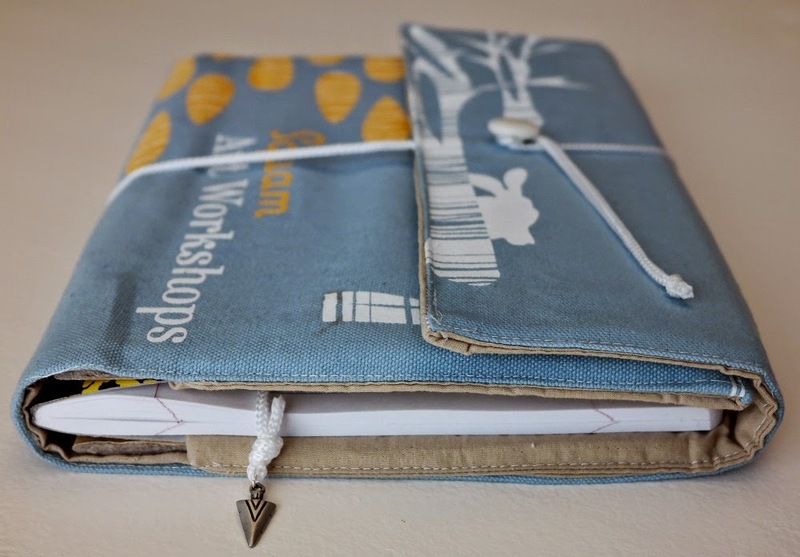 Open fully to reveal the journal in the center and the bookmark dotted with an arrowhead charm. On the left, two pockets, one of which holds my address book. A quote was added at the upper left. I discovered this quote in September 2013 and it has guided me ever since. I thought it appropriate for it to guide this project, too. The back shows the little fox in the trees. All together again with a slightly better view of the arrowhead charm on the bookmark. My favorite shot of the journal cover because of the blur of the background. I had no idea until I took a photography class later that it's called depth of field. The effect here was before I knew that, and therefore, a happy accident. The white cord for the strap and bookmark had been sitting in my sewing box for years. The arrowhead charm was left over from an old jewelry project. Structural elements to stiffen the back for a sturdy base on which to write are actually covers from an old book. Frankly, I had the thread and the button, too. Only the liner is new. In all fairness the design is based on a French Desk Set design I found on Pinterest. I made a few modifications to fit my needs and had to make some alterations to use selective panels from the tote bag. All in all, I'm happy with the results. I look forward to seeing all the other creative ideas that this contest produces. Whatever happens, I enjoyed making this and love having a pretty nifty one-of-a-kind journal cover to take me though my days. If you like this, help me out by "liking" my photo of it at my Instagram account (click here). Awww, thank you! True, the Instagram folks really want their app used from mobile devices rather than computers, which can be a problem sometimes. I had a lot of fun putting this project together, which surprised me because I literally have not sewn in about 15 years (had no desire to do so). It seemed to "unearth" an old hobby and now I can't stop thinking of more projects to make.